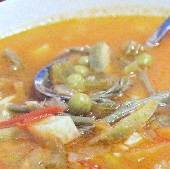 This is a favorite soup in my home on rainy days. We serve it with grated kefalotyri (good substitutes are pecorino and parmesan). If using thick stalked celery, clean well and slice very finely. 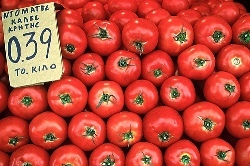 Peel the tomatoes and cut into large pieces. 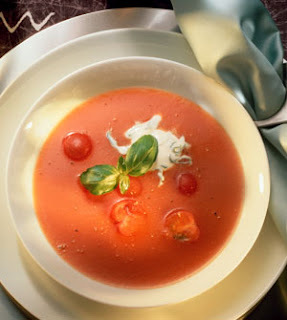 In a pot, combine tomatoes, carrot, celery, onion, and garlic. Add a little water and boil for 20 minutes. Puree the mixture in the processor bowl, and return to the pot. Add the olive oil and boil for 5 minutes longer. Stir in the pasta and remaining water, lower the heat, and simmer covered for 20 minutes. Remove from heat, add salt and pepper to taste, and allow to rest for 10 minutes before serving. 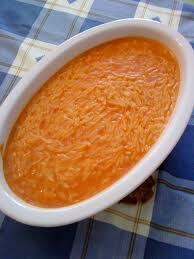 Serving suggestions: This soup tastes great with grated cheese on top. Here in Greece, we tend to use our locally produced hard, salty cheeses, but it’s also very good with grated cheddar.